Holsteen, Nathan D., and Michael J. Svigel, eds. Exploring Christian Theology: The Church, Spiritual Growth, and the End Times. Minneapolis, MN: Bethany House, 2014. 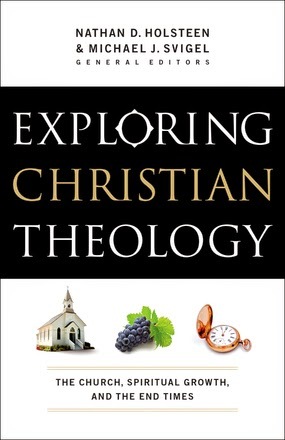 This volume of Exploring Christian Theology is authored and edited by Drs. Nathan Holsteen and Michael Svigel, professors at Dallas Theological Seminary, with contributions from other DTS professors. The focus of the volume is spiritual growth and the end times, or in more technical terms, sanctification and eschatology. Holsteen authors the section on spiritual growth and Svigel on the end times. Each section contains a “high-altitude survey” or overview of the topic, “passages to master” or the main biblical texts related to the topic, a retrospective look at the topic from the perspective of church history, principles to put into practice, key facts to never forget, dangers to avoid, quotations from Christian voices from the past and present, and shelf space: recommendations for your library, an annotated list of significant works. The volume is rounded out by a glossary and Scripture index. There are numerous user-friendly diagrams and sidebars. There is much to like in this volume. It is comprehensive without being laboriously extensive. At around 250 pages, it is not a long work, but there is much here. The authors take seriously theological traditions and church history and treat both with respect and fairness. There are extensive selections from past and present Christian thinkers. Although the topics are academic, this volume is also pastoral and one gets the sense of the authors’ passion for both God and His church. This is usually most evident in the facts to remember and dangers to avoid sections. Bibliophiles will enjoy the annotated bibliography. The writing style of Holsteen and Svigel is serious but accessible and lively. As far as criticisms go, I only note two observations. The first is one more of preference. Namely, I would prefer footnotes to endnotes. Second, I wonder whether it might be easier on the reader to combine the retrospective and voices from the past and present sections. I can see how separating these sections might have some benefit, but the voices from the past are just presented without any context other than a heading which identifies the particular church period in which it falls. I wonder whether those who will likely read this book have enough background to benefit from these excerpts as they stand. It may also make it easier for less-diligent readers to forgo these primary sources altogether by skipping the section (which would be unfortunate). In sum, this volume of Exploring Christian Theology is to be commended. It could be useful for pastors, church study groups, Bible college students, and maybe even introductory-level seminary classes (though this would probably need to be supplemented with other texts). Much Thanks to Bethany House for providing the text used in this unbiased review.